Despite our efforts to reduce carbon pollution, we need to ensure Vancouver is prepared for the impacts of a changing global climate. Adapting to climate change means understanding what climate we are likely to experience in the future, and creating proactive plans that take advantage of opportunities and prepare for impacts. This is different than mitigation, which refers to our efforts to limit climate change by reducing greenhouse gases. In 2012, Council adopted the Climate Change Adaptation Strategy to ensure a vibrant, liveable, and resilient city in the face of climate change. The strategy is currently being updated. Help shape the strategy and let us know what matters to you. How much do you know about sea level rise? Take our short quiz to test your knowledge. How many meters of sea level rise are we planning for by 2100? We are planning for one meter of sea rise for 2100. The Province of BC provided this projection for local municipalities. Sea level rise is partially caused by the melting of land ice and ice sheets adding water to our oceans. What causes this phenomenon? High levels of greenhouse gas (GHG) emissions. Greenhouse gas emissions trap heat in the earth’s atmosphere, leading to rising air temperatures and the melting of land ice. As the ocean creeps up due to sea level rise, the beach area exposed during low tide will shrink. What is this phenomenon called? Coastal squeeze. This will result in the loss of habitat of birds, forage fish, mussels, and clams in Vancouver’s shoreline ecosystem. With one meter of sea level rise, how many square kilometres of land in the City of Vancouver will be in the flood plain? 13 square kilometers. This estimate is based on a projected sea level rise of one meter and without flood management interventions. Complete the sentence: The City of Vancouver has a plan to reduce greenhouse gas emissions by at least __% by the year 2050 through our Renewable City Strategy. 80%. Reducing greenhouse gases will help reduce the amount of sea level rise we will have to adapt to. Learn about the Renewable City Strategy. In 2012, Vancouver City Council adopted which strategy to ensure Vancouver remains vibrant, liveable, and resilient in the face of climate change? The Climate Change Adaptation Strategy. Because sea levels don’t respond instantly to warming, we are committed to a certain amount of continued sea level rise into the future. Learn more about the Climate Change Adaptation Strategy. What action(s) can you take reduce individual Greenhouse Gas (GHG) emissions? You can compost your food waste, eat more vegetarian meals, insulate your home and reduce energy leaks, and use transit, cycle, or walk more. These are a few ways that you can curb your emissions and help slow sea level rise. By 2050, we are expecting hotter, drier summers, wetter falls and springs, and warmer winters. Extreme weather events will be more frequent and intense, and sea level rise is anticipated to be 1 meter by 2100. We expect twice as many days above 25°C in the 2050s. See what you can do. Climate change will increase the frequency and intensity of heavy rain. Learn how we're responding. We expect an increased frequency and intensity of extreme rain events. Amount of rain on very wet and extremely wet days attributed to climate change. Changes in temperature, rain and sea level may shift the timing of growth, migration and disturbance cycles of plants and animals. Changes in temperature, rain, and sea levels may alter where plants and animals can thrive. This could also lengthen our crop growing season. Increase in the length of the growing season. Increase in warm days that support plant growth. Learn what climate change means for heating, cooling, and protecting our homes. The province projects 1m of sea level rise by 2100. Here's what that means for us. 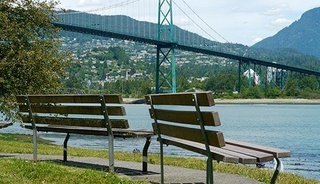 Vancouver's sea levels are expected to rise 1 meter within the next 100 years. See documents and background for the climate change adaptation strategy. What we're doing to incorporate climate change adaptation measures into operations.